This publication on the work of landscape architect, city planner, and architect Alexandre Chemetoff features the complete oeuvre of Chemetoff’s projects and includes a DVD that captures the seven visits on film (in French with English subtitles). The French landscape architect, city planner, and architect Alexandre Chemetoff (b. 1950) achieved international renown for his "Jardin de Bambou" at the Parc de la Villette in Paris and his design of a park in Villejuif. 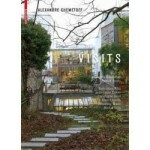 Visits takes a close-up look at his work of the last fifteen years, not, however, in the form of a traditional monograph. Instead, Chemetoff visits the sites of five of his major works: Blanquefort/Bordeaux, Ile de Nantes, Angoulême, Vallée de la Bièvre/Paris, Grenoble, Nancy, and Rennes. He is accompanied on his visits by conversation partners who are recognized experts in the field: Dominique Alba, Jean-Louis Cohen, Christophe Girot, Patrick Henry, Alain Léveillé, Sébastien Marot, and Michel Velly. In this way, the principal themes of Chemetoff’s creative work come up for discussion in a lively, critical, and fascinating manner. It is especially illuminating to discover how well a given project has stood the test of time, how it has changed over the years, and what Chemetoff would do differently today.